Meharry Medical College is a private, independent professional medical school affiliated with the Un…. 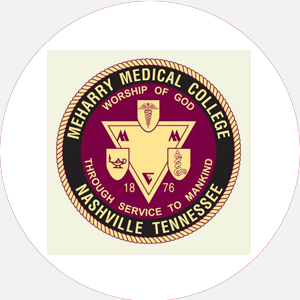 Meharry Medical College is a private, independent professional medical school affiliated with the United Methodist Church. Meharry was founded in 1876 as the Medical Department of Central Tennessee College. Ten years later, the Dental Department was established, and in 1889 a Division of Pharmacy was established. In 1900, the name changed to Meharry College of Walden University. After receiving a separate state charter from Walden University in 1915, the school became Meharry Medical College. Meharry has emerged from the early years, which were marred by discrimination and economic deprivation, to take its place among the leading schools preparing health professionals. Meharry continues a tradition of growth in both programs and facilities. The College ../includes the Schools of Medicine, Dentistry, Graduate Studies, and Allied Health Professions. About 40 percent of all black physicians and dentists are graduates of the school. Meharry considers all of its graduates to be distinguished or notable alumni. Meharry Medical College is accredited by the Southern Association of Colleges and Schools to award the Doctor of Dental Surgery, Doctor of Medicine, Doctor of Philosophy, and Master of Science in public health degrees. Certificates in health professional training are also offered. Contact AMCAS (medical); contact AADSAS (dental); April 21 (graduate school). Applicants for admission to the medical or dental schools must be graduates of an approved secondary school or its equivalent with at least three full academic years of acceptable college credit earned in a college or institute of technology currently approved by an agency recognized by the Association of American Medical Colleges and by one of the regional Councils on Medical Education of the American Medical Association. Medical Admission: Satisfactory completion of three years of premedical education is required by September of the year that the applicant desires to be admitted. This must include the following semester/quarter hours, respectively: 8/12 general biology or zoology with laboratory, 8/12 general chemistry with lab, 8/12 organic chemistry with laboratory, 8/12 general physics with laboratory, and 6/9 English composition. Recommended electives for medical applicants include general botany, mathematics, economics, history, psychology, sociology, foreign languages, philosophy, fine arts, and logic. Applications should be sent to the American Medical College Application Service (AMCAS). The AMCAS application fee is for the first school, with a decreasing scale of fees for each additional school the student designates. AMCAS will forward applications to schools the student designates. Students can contact AMCAS online at http://www.aamc.org to download applications and to get the most current application deadlines and fees, or contact AMCAS at 2450 M Street, NW, Washington, D.C. 20037; Telephone: 202-828-0600. Once Meharry Medical College receives the applications from AMCAS, the Admissions Office promptly forwards supplementary materials that must be submitted to complete the application process. At this stage, the school requires a nonrefundable application service fee of . Applicants are encouraged to submit materials well in advance of the deadline to allow sufficient time for receipt of all materials requested. Selected applicants are invited for a personal interview. Dental Admission: Recommended electives for dental applicants include embryology, comparative anatomy, quantitative analysis, mechanical drawing, mathematics, economics, history, psychology, sociology, foreign languages, philosophy, and fine arts. An average grade of at least C in each subject field is required. Students must meet the specific requirements of the school or division in which admission is sought, be in the upper half of class; and be invited by the admissions committee for a formal interview. Applications should be sent to the American Association of Dental School Application Services (AADSAS). Contact AADSAS for cost of application fee and deadlines. AADSAS will forward applications to Meharry Medical College. Meharry’s Admissions Office will promptly forward supplementary materials that must be submitted to complete the application process. At this stage, a nonrefundable application fee is charged by the school. Graduate School Admission: Students applying to the School of Graduate Studies must submit GPA, GRE test scores, and an official transcript from all secondary schools attended; hold a bachelor’s, master’s, or advanced degree from an accredited college or university with an overall B average and a B average in science courses; submit two letters of recommendation from instructors in the natural sciences; and submit a written essay. Applicants applying to the School of Graduates Studies should apply directly to Meharry Medical College, School of Graduate Studies, Nashville, Tennessee 37208. A processing fee is required. Admission Application Deadline: Contact AMCAS (medical); contact AADSAS (dental); April 21 (graduate school). Admission Contact: Director of Admissions, Meharry Medical College, 1005 Dr. D. B. Todd Jr. Boulevard, Nashville, Tennessee 37208; Telephone: 615-327-6223; 615-327-6228 (fax). Doctor of Medicine (M.D. ): For the Doctor of Medicine, students must satisfactorily complete all academic work required for the M.D. degree as well as the Clinical Clerkship of eight weeks in each of the following: internal medicine, pediatrics, surgery, obstetrics and gynecology, family and preventive medicine, and psychiatry; must have successfully passed Part I and Part II of the National Board of Medical Examiners (NBME); and must be recommended by the faculty to the Board of Trustees of the College as representing a person of good character and of acceptable scholastic attainment. Candidates are required to wear the regalia specified for their degree. Doctor of Dental Surgery (D.D.S. ): For the Doctor of Dental Surgery, students must complete all didactic courses, clinical requirements, practical examinations, and Mock State Board Examinations; must pass Part I and II of the National Board of Dental Examinations at the national-level standard; and must maintain regular attendance for a minimum of four years of total instruction. Transfers must complete at least two years at Meharry and must demonstrate high standards of moral and ethical conduct. Doctoral Degree (Ph.D.): For a doctoral degree (Ph.D.) in biochemistry, biomedical sciences, microbiology, pharmacology, or physiology, students must complete the major requirements as well as core requirements; must pass a comprehensive examination prepared by the Committee on Instruction; must complete a dissertation approved by the Committee on Instruction, the department, and the Graduate Dean; must complete an oral examination; and must be in residence for two years. Total enrollment (men/women): 366/534 In-state: 260 Full-time undergraduates (men/women): 36/148 Graduate students (men/women): 330/386 Ethnic/racial makeup: African American, 674; Asian, 73; Caucasian, 96; Hispanic, 18; International, 35; Native American, 4. Campus Regulations: Students must participate in mandatory group health insurance unless student has a better plan. Campus Services: Health center, personal and psychological counseling, and career counseling and placement. Campus Activities: Lectureships provide Meharry students the opportunity to have academic interchange with renowned persons from various health-care disciplines in conferences, Grand Rounds, informal discussions, and formal lectures. Table Clinic Day provides an opportunity for first-year dental students to participate in a presentation of an in-depth study on an aspect of dental health. Students may get involved in the Graduate Student Association; the student-run newspaper, FOVEA; the Meharry Wives Clubs; and other student-run organizations. Greek sororities include Alpha Kappa Alpha, Delta Sigma Theta, and Zeta Phi Beta; fraternities include Alpha Phi Alpha, Kappa Alpha Psi, Omega Psi Phi, and Phi Beta Sigma. Honorary medical societies represented include Omicron Kappa Upsilon Honor Dental Fraternity, Sigma Phi Alpha Dental Hygiene Honor Society, Chi Delta Nu Fraternity, and Kappa Sigma Pi Honorary Dental Fraternity. Housing Availability: 305 housing spaces available. Women-only housing and family housing are available.